An influential group of artists recently published the following statement in the Neue Westfalische newspaper in Germany. Thanks to PLD Magazine for translating this and sending it to me. Martin and Sharon from Light Collective have created this T shirt for us. Please do go and buy one! Show your support for our campaign! 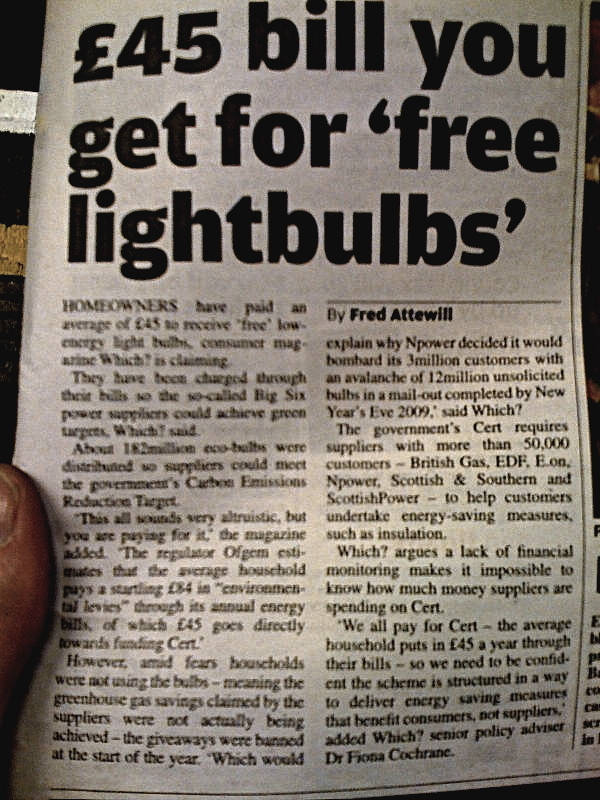 No such thing as a free Lightbulb! OK so there is a bit of exaggeration as the money has been spent on other things as well as CFLi give-aways. Some is spent on the very heavily discounted lamps still being sold in DIY superstores and Supermarkets, EON are even getting their name printed on the boxes by Philips! So you could say that we are now being forced to pay for something we don’t want and is not working to create the energy savings promised!